The ressemblance is very particular inter the Führer Adolph Hitler and…his son?? Adolf Hitler would have had a son with French. Jean-Marie Loret wanted to take his ancestry before abandoning following the advice of his lawyer and his children. This is a somewhat surprising information that was unveiled last year in 2012. Adolf Hitler would have had a son … and he was French! The story’s told this man, described by his lawyer as someone rather large, speaking perfect French without an accent and not looking like a weirdo, is quite amazing. « Master, I am the son of Hitler! Tell me what I should do, » he said upon landing in the office of François Gibault in the late 1970s. 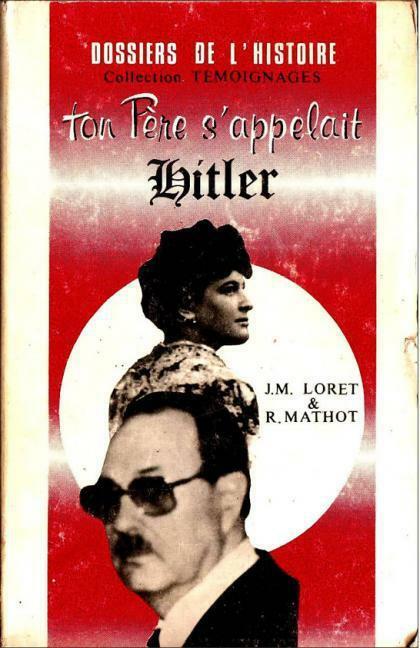 Jean-Marie Loret is the son of Adolf Hitler. Here is his story. In 1914, when Adolf Hitler was a corporal in the German army against the French troops in Picardy, he has a habit, like other soldiers, to be « sent back » to have a good time and relax. It is in a small town west of Lille, Fournes-en-Weppe more precisely, Hitler met Charlotte Lobjoie. She reveals to his son many years later then 16 years old she was « hay, with other women, when [they saw] a German soldier, installed on the other side of the street. It was a kind of cardboard and draw seemed. All women found this interesting soldier and showed curious to know what he was drawing. [Charlotte] designated to try to approach. » After lengthy conversations between the soldier and the peasant girl, begins a relationship that will last several weeks. She continues: « When your father was there – very rarely – he liked to take me for walks in the countryside. Walks But these generally ended rather badly. Indeed, your father, inspired by nature, undertook a discourse which I did not understand much. Unable to speak French, he declaimed in German, addressing an audience away. If I spoke German, I could not follow him, especially as the story of Prussia, Austria or Bavaria I was not familiar, far from it. My reaction put your angry father saw me stay with marble effect oratory « . This anger and frustration present in this young soldier, were confirmed when Corporal turned into huge tribune. It is an evening in June 1917, following an evening a little sprayed that Hitler is very enterprising with the peasant girl. Nine months later, in March of the following year a son was born. Jean-Marie often fights with his classmates because in the village, it is considered a « son of Boche. » Years later, when Adolf Hitler became sadly this famous orator, Charlotte is shameful. She wants to hide the identity of the father, and sometimes even to abandon this son and give it to another couple easier. In 1934, Jean-Marie was adopted by the « new family ». Even if his « real father » does not want to recognize it, it remains insistent with the peasant, to whom he wrote often. In the early 1950s, Charlotte confesses to his son the true identity of his father. « In order not to fall into anxiety, I worked tirelessly, never taking holidays, never distracting: 20 years without going into a movie theater, » said Jean-Marie Loret, totally shocked by this announcement. He even published a book in 1981 by Editions de l’Université and Modern Education. The title? Your Father was called Hitler. A confession which has not been successful. Because it is becoming an adult and father, he wants to formalize this ancestry. A historian then returns to the scene of his childhood, interviewing witnesses and began a series of investigations. Program, expertise identification method by comparative physiognomy, another of the Institute of Anthropology and Genetics at the University of Heideberg a comparative study between Adolf Hitler and psychographologique Jean-Marie Loret and that comparing handwriting writings of both men. All these investigations are conducted to see the similarities and lead to the same conclusion. It is likely that Jean-Marie is the son of Hitler! More physical resemblance is rather striking. Other details emerge. During the Occupation, the officers of the Wehrmacht delivered cash to Charlotte. This silver in envelopes in addition to canvas signed « Adolf Hitler » Jean-Marie was found in the attic of the house after the death of his mother and a portrait strong like his mother discovered in Germany. I must admit that this « new » induces a convergence between historians of different countries. German and Japanese historians seem to accept these findings as the French historians try to sidestep the issue and not see the truth in the face. In 1979, in the office of Maître François Gibault, Jean-Marie Loret lands. The lawyer says: « When he comes to see me in 1979, I have before me a man a little geek who does not know whether to be recognized as the son of Adolf Hitler or must delete all This stroke of a pen. He feels that many children feel natural: the desire to find a past as heavy as it is, but the fear of old sludge return. I talked a lot with him playing more the role of a psychologist than a lawyer. Certainly, he could claim a share of the copyright of Mein Kampf and, why not, bank accounts that the Führer had perhaps opened in Switzerland, but 60 years was it reasonable? After talking with me and his children, he himself decided not to reveal his vital sulfur. » But a few months later, as was mentioned earlier, Jean-Marie Loret publish a book. Unnoticed on the national territory, it is the Country of the Rising Sun, Jean-Marie will be a voice. Invited to the Japanese public television, he is presented as the son of the Nazi dictator. For the anecdote, in 1940, the combat units of Jean-Marie leads a fierce battle in the Ardennes against German troops. It is under the occupation of Hitler’s son is engaged in the CMO (Civil and Military Organization). Ignoring its origins at the time, he enlisted in the armed resistance to Hitler. Its name, the organization will be … Clement. 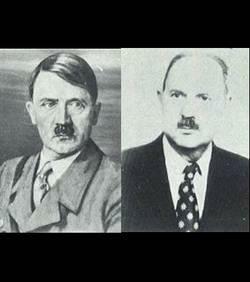 Jean-Marie Loret, who died in 1985, was the hidden son of Adolf Hitler and a resident of Fournes-en-Weppes. Information date 30 years ago but the spring Point on Friday and was able to make a « buzz ». Adolf Hitler had a son and his mother would be hidden from the North, Fournes-en-Weppes precisely. Jean-Marie Loret, that was his name. He was born as the result of an affair between his mother and Corporal Adolf Hitler in 1917. At the time, the soldier enlisted in the German army. These soldiers would relax regularly Fournes-en-Weppes, a small town west of Lille, near La Bassée. Here Hitler met Lobjoie Charlotte, a young woman of 16 years. In March 1918, a son was born. The eyes of the children of the village, little Jean-Marie is a « son of a Boche. » Charlotte never expressed the mysterious circumstances surrounding the birth of his son. His « father », Adolf Hitler, does not recognize, refuse to see, but still far away to get news of his mother. Fairly quickly, Jean-Marie Loret was abandoned by his mother and adopted by a family who, strangely, finds himself the owner of a building in Frankfurt, it does not pay. We also know that during the Second World War, Jean-Marie Loret would have joined the Freikorps and would become resistant to Hitler’s armies. Are we sure of the veracity of this story? For Japanese and German historians, said Le Point, there is no doubt, Hitler did have a son. But their French counterparts are more skeptical. However, there are factors that weigh in favor of the truth of this amazing story: During the Occupation, the officers of the Wehrmacht would have brought envelopes of cash to Charlotte. In addition, Jean-Marie Loret found in the attic of the family paintings signed by « Adolf Hitler », and in Germany a likeness to his mother was found. Jean-Marie Loret will fight until his death in 1985 in order to recognize his ancestry … but just perdu.Il write a book that passes unnoticed in 1981.Comme what no one can claim to be a prophet in his country! Far from fading, Nazi Conspiracy and this is more powerful than we croit.Quand elements may bring Truth about Hitler, the corrupt and deceitful » system » New World Order just fold the cover above. Keeping people in lies and ignorance, » system » is perpetuated by our complacency, our refusal to see or inconvenient truths … and our neglect caused by the research facility.